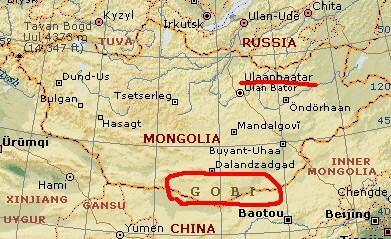 ▲　The highest atitude in Mongolia is 4374 meters above sea level and it is the peak of Khuiten Uul in the Altai Tavan Bogd Mountain. 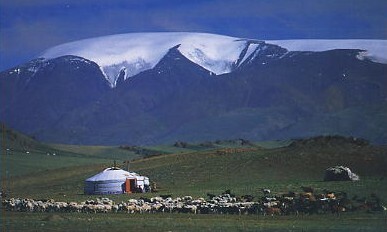 ▲　Breath taking Tsambagarav Mountain looms in the distance. 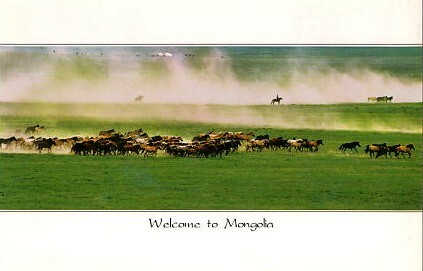 Mongolian horses gives it scale. 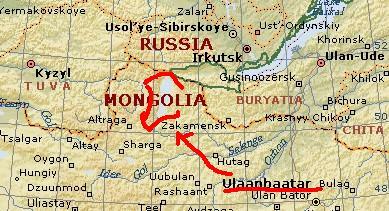 ▲　Mongolians call the Khuvsgul Lake " Mother Ocean". 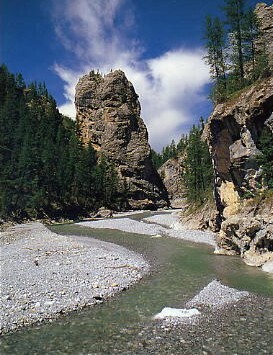 With its pure, clear water and ring of mountains, visiter liken it to Switzerland. 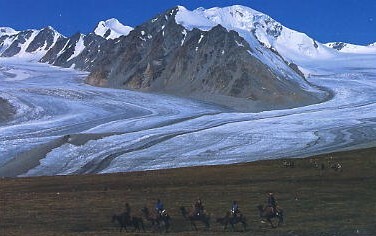 At 130km long and 262m in deep. 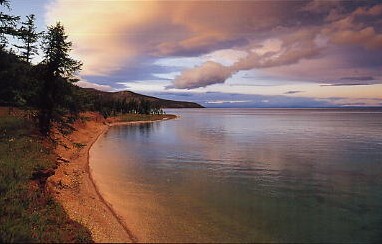 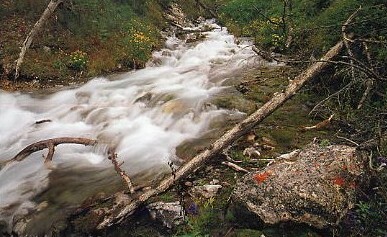 Lake Khuvsgul is Baikal's sister. 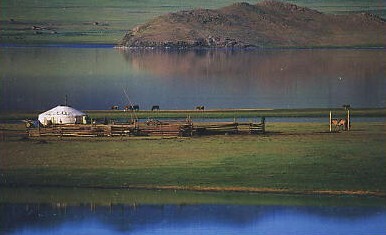 ▲　Lake Khargal (ハルガル湖）　The fresh air of the Khargal range. 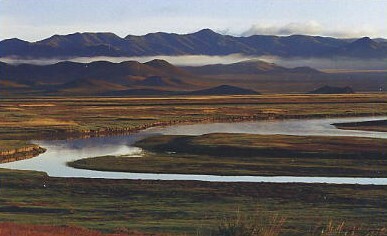 There are many beautiｆul lakes in Northern Mongolia. 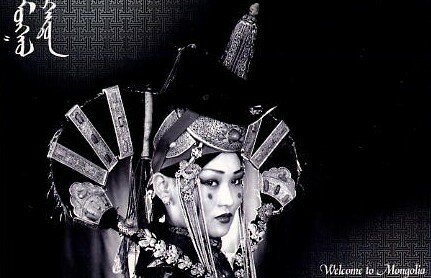 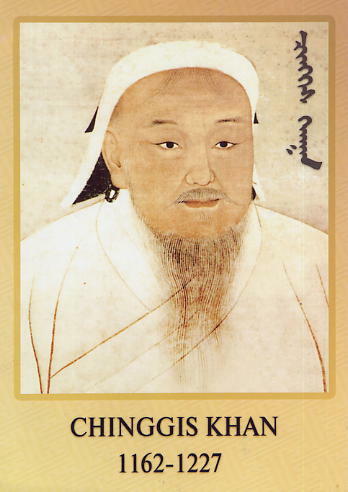 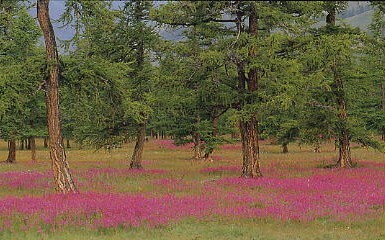 ▲　The songs of birds abound in Mongolia's natural paradise. 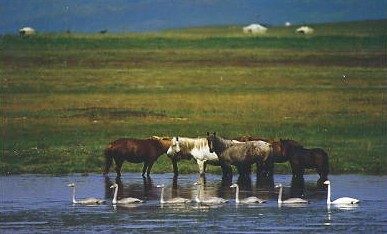 ▲Birds frolic on the lake. 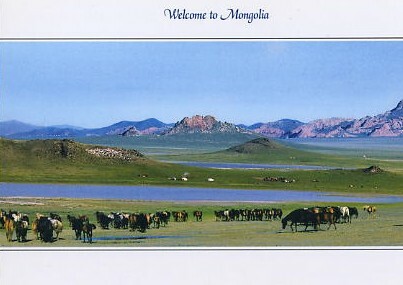 This bucolic scene is all over Mongolia. 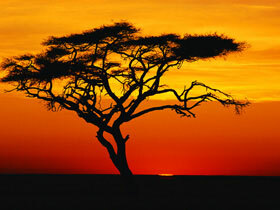 Noisy　cities are a world away. 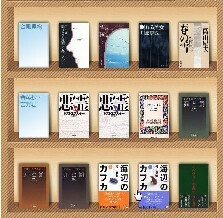 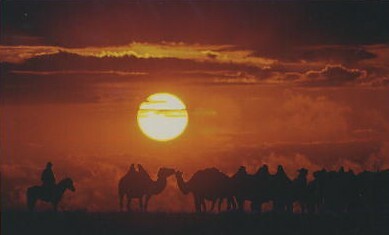 ▲　Ｔhe dust of many animals reaches toward the sky. 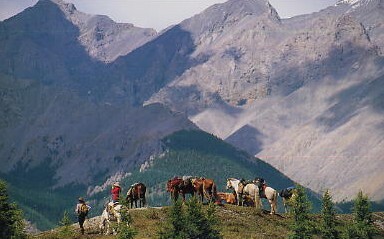 The children of the herders are taking their animals to a new location./Red mountain pass. 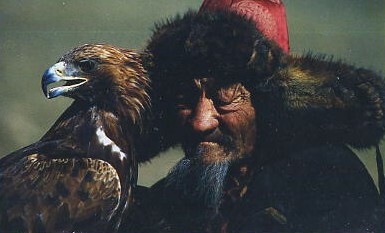 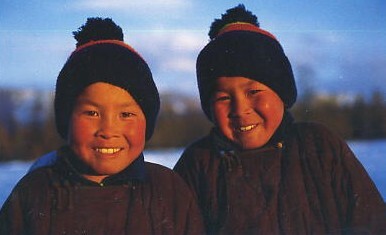 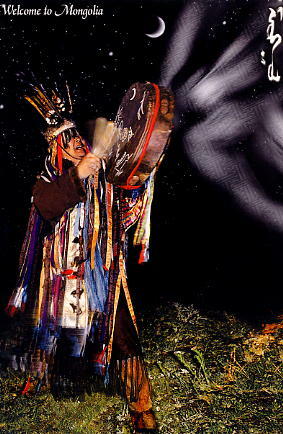 ▲　Nearly 1000km from any large town , named families dwell near the high Altai. 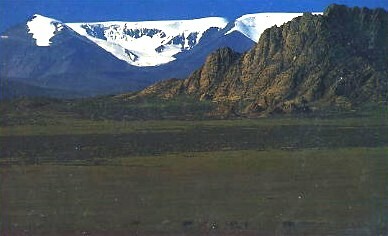 ▲　A summer thunderstorm builds over the Zoolongyn Mountains at Khongoryn Els. 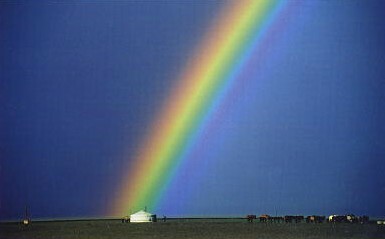 ▲　A rainbow lights up the sky、and seems to touch a nomadic ger, after a summer rainstorm in the Gobi Desert. 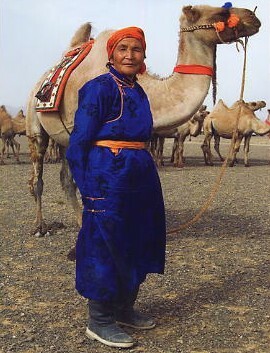 ▲　A woman and her camel are dressed up for a festival. 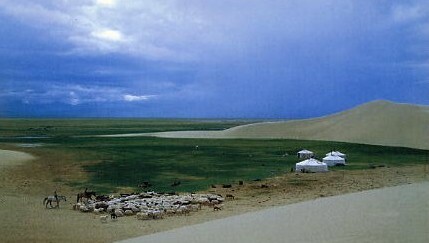 Camels are the hardiest of linestock in the difficult environment of the Gobi Desert. 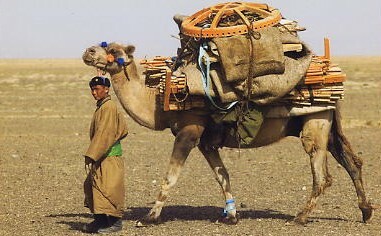 ▲　An entire ger, including the frame, the door, felt insulation, and the cover, travels on the back of one camel. 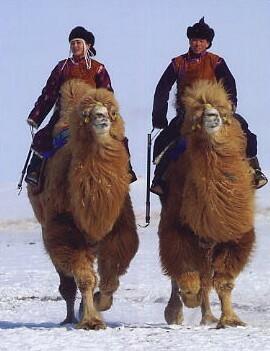 ▲In the winter, camels grow wool many inches thick- one of many adaptations that allow camels more than any other livestock to survive the harsh conditions of the Gobi. 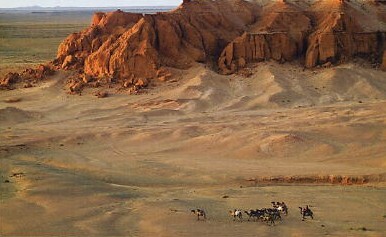 ▲A herder moves his camels past the base of the Flaming Cliffs, where dinosaur eggs were first discovered in Mongolia. 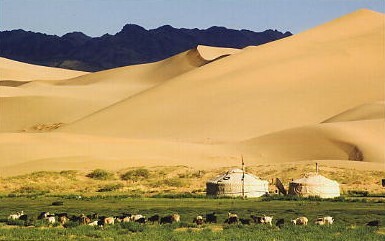 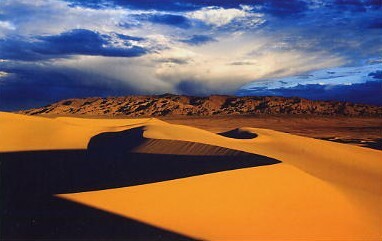 ▲Spring-fed wetlands at the base of the Khongoryn Els dunes provide lush grazing in the middle of the arid Gobi Desert. 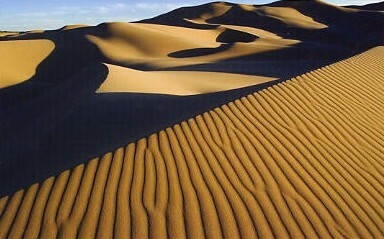 ▲The dunes at Khongoryn Els , which stretch for more than 100 kilometers, are created by wind channeled between parallel mountain ranges. 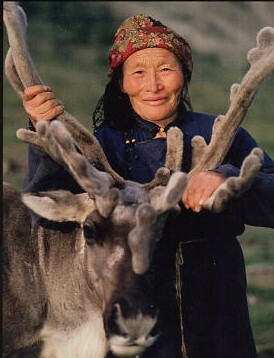 ▲The Tsaatan, or Dukha, herd their reindeer in the Sayan Mountains near Siberia. 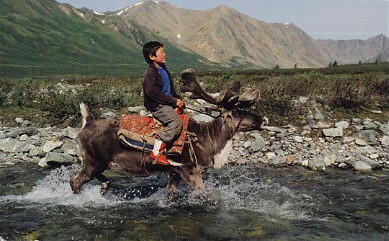 ▲　More sure-footed than horses , domestic reindeer are ridden by Dukha adults and children. 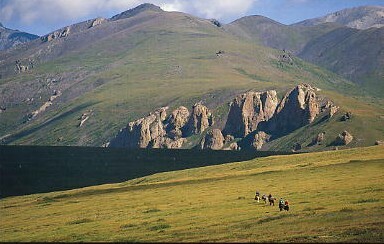 ▲　On the trail to the Darhat Valley, visitors pass by the high peaks of Khoridol Saridag. 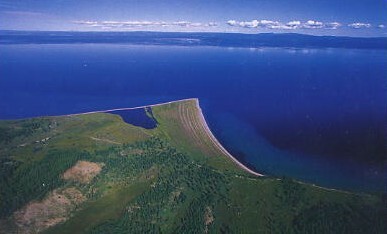 ▲　Lake Khovsgol contains 1~2% of the world's fresh water and is 262 meters deep. 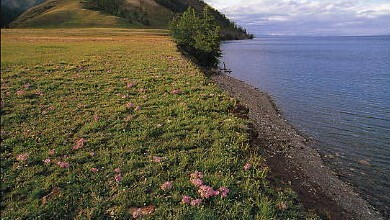 ▲Purple aster mix with other flowers and grasses on the lakeshore at Jiglig Gol. 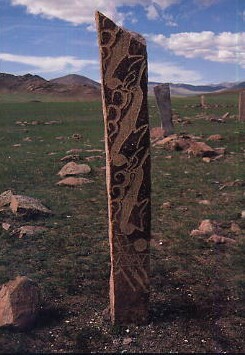 Scientist believe that deer stones,named for their stylized animal designs, were probably carved 2,500 to 2,800 years ago. 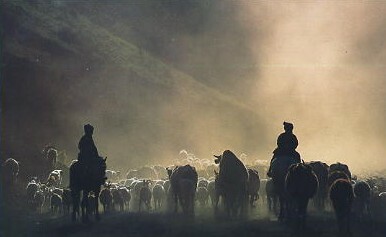 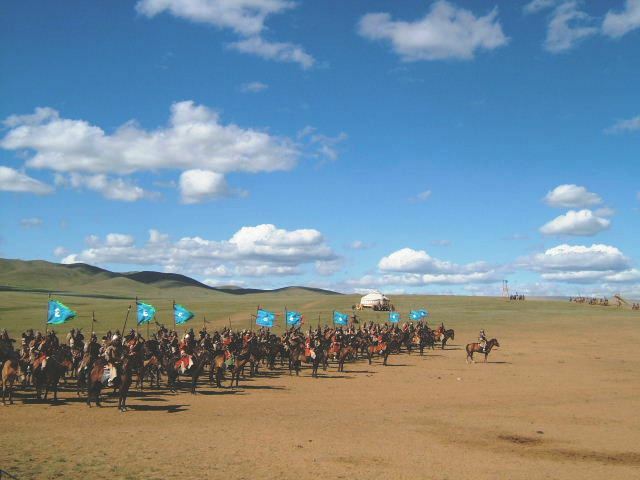 ▲Horse trekking from Khatgal to the Darhat Valley is a multi-day riding adventure.